MAAF is the peripheral intelligent terminal of an automated system enabling central government to eliminate tax evasion risks and the costs of physical stamp duties handling. MAAF terminal prints stamp duties received from the remote services centre. With the MAAF terminal, retailers no longer have to make advance payments and consumers know they will find the stamp value they need in any outlet. 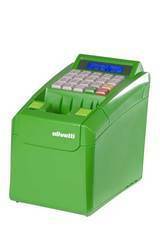 The device features advanced security functions: identification of every label issued for system monitoring, point-of-sale and operator recognition, encryption techniques for data transmission and management.